The perfect complement to open plan living is the virtually invisible glass room partition - there when you want it, gone when you don't. Even when our Frameless Glass Doors are in position and fully closed, light flow and an uninterrupted view maintains the illusion of brightness and space. 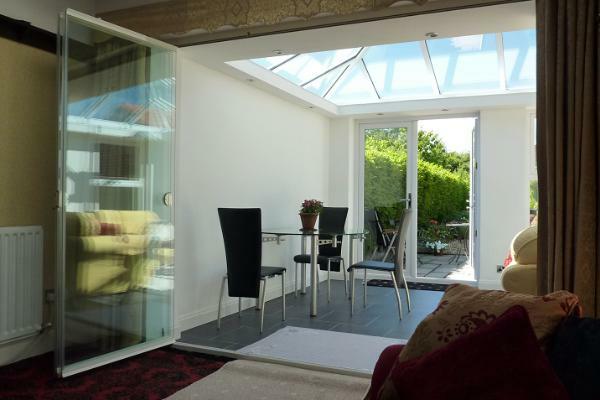 A frameless glass room divider is also perfect for dividing your kitchen and conservatory, as it will help to retain heat in the winter, but is also fully retractable for summer use. Frameless sides to each glass panel divide a living space physically but not visually. The bottom rail is 40 mm high - or it may be set into the floor within a channel, which can prepared by a reputable local builder* prior to survey / installation. When the doors are fully open, the narrow profile ensures maximum access between room areas. Please view our gallery. Frameless Glass Doors comprise a single door that opens conventionally plus a number of glass panels that slide along tracks to the end of the opening, then pivot to rest inconspicuously against the end wall, maximising the access space. If you just want to let some air flow, the panels can be positioned anywhere along the track. If you want to create a little more atmosphere, glass options include tinted. What's Different About Our Room Divider? There are many types of glass room dividers out there, so why choose ours? The reason is simple, many other companies manufacture and supply frameless room dividers, but they are not fully retractable with a single access door as standard. This means that you can have the doors fully open for that special occasion, and then when closed you have ease of access using the single access door. Better still, the entire system is frameless so there are no interrupted views.